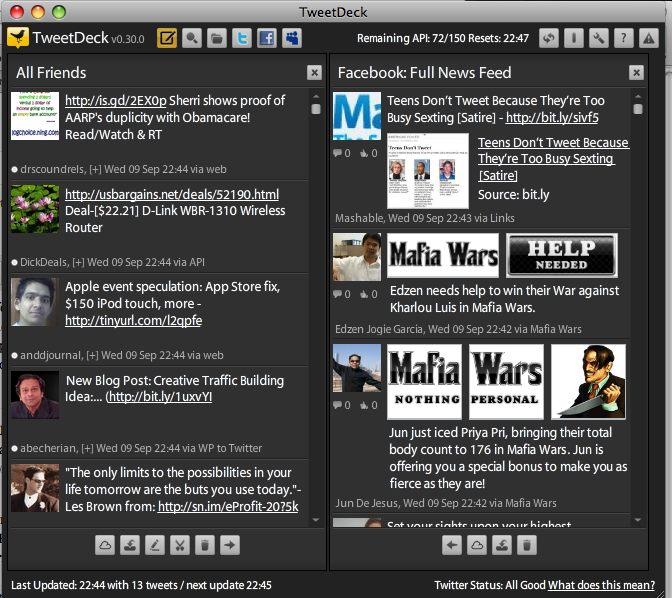 Right after I bought my Mac, I kept on encountering various good feedback for desktop Twitter client – TweetDeck. So I quickly downloaded TweetDeck and it has become my desktop Twitter client since then. It pretty much does the job of keeping me updated with my Twitter account. But how I wish that Tweetdeck would also get streams from Facebook – and it did, just now via TweetDeck version 0.30.The new TweetDeck version is an answer to all the users’ prayers. Tweetdeck now gets various streams not only from your Facebook account but for mySpace as well. But since I’m not really using my MySpace account so much, so I’m more excited by the Facebook integration. The good news is, the Facebook integration runs smoothly. You can get your Facebook accounts’ Full News Feeds, Status Updates, Wall Posts, Photos, Videos and Other Facebook information. You can also group your Facebook friends and opt to get only their updates on your TweetDeck account. If you’re still using MySpace, you can also authorize TweetDeck to get your Friends’ updates to show up on another column in your TweetDeck account. Now aside from these new features, another perhaps breakthrough feature that TweetDeck just launched is the TweetDeck directory. This directory gives you a list of Twitter users categorized by subject. You can check out topics that interest you and find people to follow on Twitter. With these great new features, it is not surprising that TweetDeck has become popuar and a top choice for dekstop Twitter client by many Twitter users who are Mac users as well.